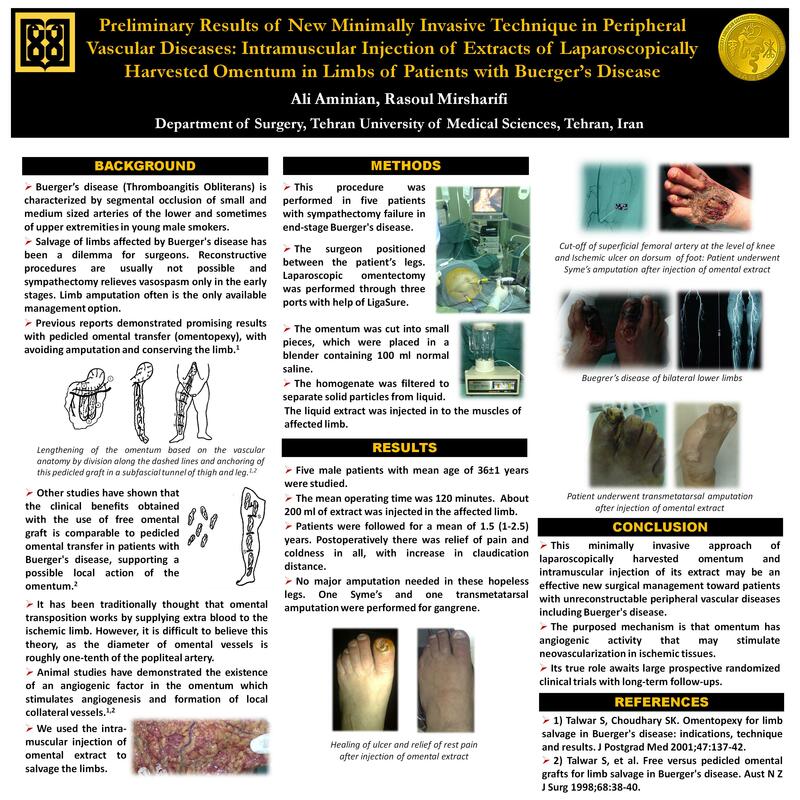 INTRODUCTION: Salvage of limbs affected by Buerger’s disease has been a dilemma for surgeons. Reconstructive procedures are usually not possible and sympathectomy relieves vasospasm only in the early stages. Limb amputation often is the only available management option. Previous reports demonstrated acceptable results with pedicled omental transfer (omentopexy). The purposed mechanism is that omentum has angiogenic activity that may stimulate neovascularization in ischemic tissues. We used the intramuscular injection of omental extract to salvage these limbs. METHODS AND PROCEDURES: This procedure was performed in five patients with sympathectomy failure in end-stage Buerger’s disease. The surgeon positioned between the patient’s legs. Laparoscopic omentectomy was performed through three ports with help of LigaSure. The omentum was cut into small pieces, which were placed in a blender containing 100 ml normal saline. The homogenate was filtered to separate solid particles from liquid. The liquid extract was injected in to the muscles of affected limb. PRELAMINARY RESULTS: Five male patients with mean age of 36±1 years were studied. The mean operating time was 120 minutes. About 200 ml of extract was injected in affected limb. Patients were followed for a mean of 1.5 (1-2.5) years. Postoperatively there was relief of pain and coldness in all, with increase in claudication distance. No major amputation needed in these hopeless legs. One Syme and one transmetatarsal amputation were performed for gangrene (figure 1). CONCLUSION: This minimally invasive approach of laparoscopically harvested omentum and intramuscular injection of its extract may be an effective new surgical management toward patients with unreconstructable peripheral vascular diseases including Buerger’s disease. However, the true role of it awaits larger studies with long-term results.